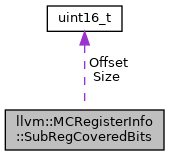 SubRegCoveredBits - Emitted by tablegen: bit range covered by a subreg index, -1 in any being invalid. Definition at line 143 of file MCRegisterInfo.h. Definition at line 144 of file MCRegisterInfo.h. Definition at line 145 of file MCRegisterInfo.h.